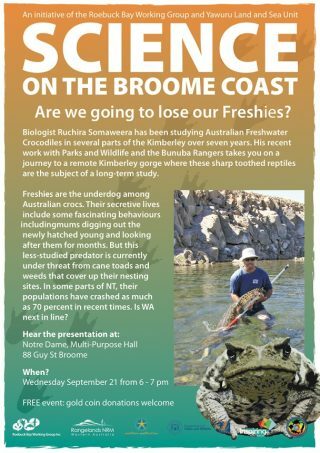 Estuarine crocodiles, the largest of all living reptiles, and Freshwater Crocodiles, slender snouted and smaller in build and overall size, will be the topic of the next Science on Broome Coast presentation on Sep 21. Dr Andrew Halford will bring you up to date on Estuarine crocodiles populations and mangement in the Kimberley, and Dr Ruchira Somaweera will tell you about his work with the Bunuba Rangers to protect Freshies from toads and weeds. This will be a ‘stand out’ in the science series. 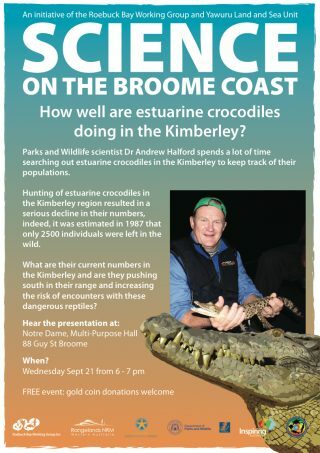 ‘How well are estuarine crocodiles doing in the Kimberley’ and ‘Are we going to lose our Freshies’, University of Notre Dame Multipurpose Hall, Wed Sep 21, at 6pm. Sponsored by Inspiring Australia, Yawuru Land and Sea Unit, WA Marine Science Institution, University of Notre Dame, Department of Parks and Wildlife, Rangelands NRM through the Federal Government Landcare Program. The Science on Broome Coast series is put on by Roebuck Bay Working Group and the Yawuru Land and Sea Unit. Roebuck Bay Working Group is comprised of Traditional Owners and government, local community, conservation groups and business. We work collaboratively to solve issues, raise awareness and encourage research and monitoring which supports responsible management and protection of Roebuck Bay. Roebuck Bay Working Group Inc.: Protection and advocacy of Roebuck Bay's outstanding natural and cultural values.